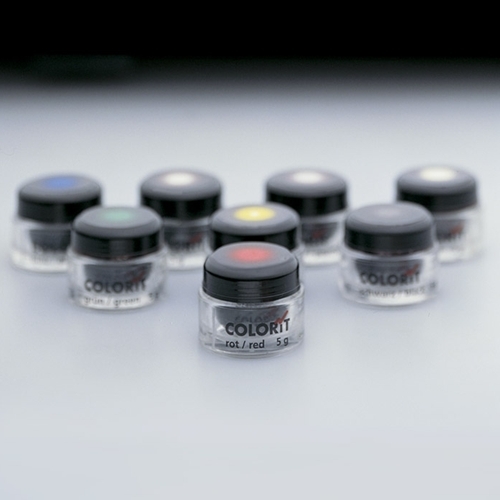 Colorit colors are available in 5 gram jars. Must be used with Colorit curing light. Colors can be used straight out of the bottle. They can also be mixed in varying proportions to obtain any hue. Standard colors are of medium saturation so they appear translucent. Add Colorit White to make the colors appear more opaque. Add Colorit Clear to make them more transparent. The powerful "Deep" Colorit colors provide strong touches of color even if applied in thin layers. The elegant iridescent Pearl White & Pearl Blue are particularly suitable for fabricating shimmering jewelry creations. Neon Yellow, Neon Red & Neon Blue glow under ultraviolet lights. Eye Effect colors are effect particles mixed with a blue-light-active acrylate. Eye Effect is designed to mix with other Colorit colors or for use as an intermediate layer(s) below another Colorit color layer. The Eye Effect pigments intensify transparent effects of transparent Colorit colors as you can see the effect pigments in different depths inside such transparent colors. Eye Effect reflects light in different intensities depending on the angle of the viewer. For a lustrous surface finish without polishing, try Colorit Hi Clear (clear polymer). Apply one coat to pre-cured colors then cure again for a brilliant finish without polishing! We stock most colors shown on the Color Chart but not all. We can special order any color that we do not stock but delivery may be 4 weeks. For special order colors, please email us for a quote. Be sure to include exact name of color and quantity needed. Please note that the settings of individual monitors will affect the accuracy of color rendering which may vary from the true color.